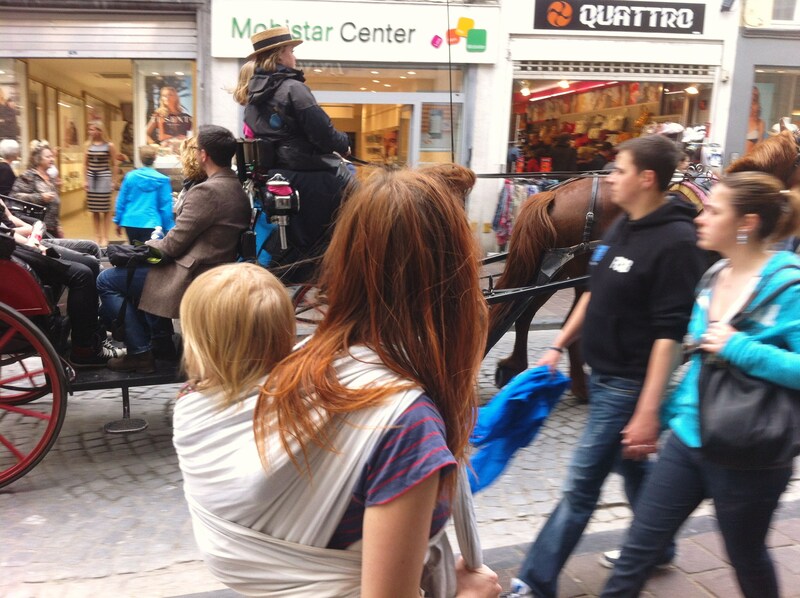 He went on to explain “The way you are carrying your child, I really like it – we do it like that back home.” I had my toddler sprawled on my back, nestled in my wrap. I used to get comments like this quite commonly when she was tiny, but now more often than not all I get are those Raised Eyebrows of Consternation! 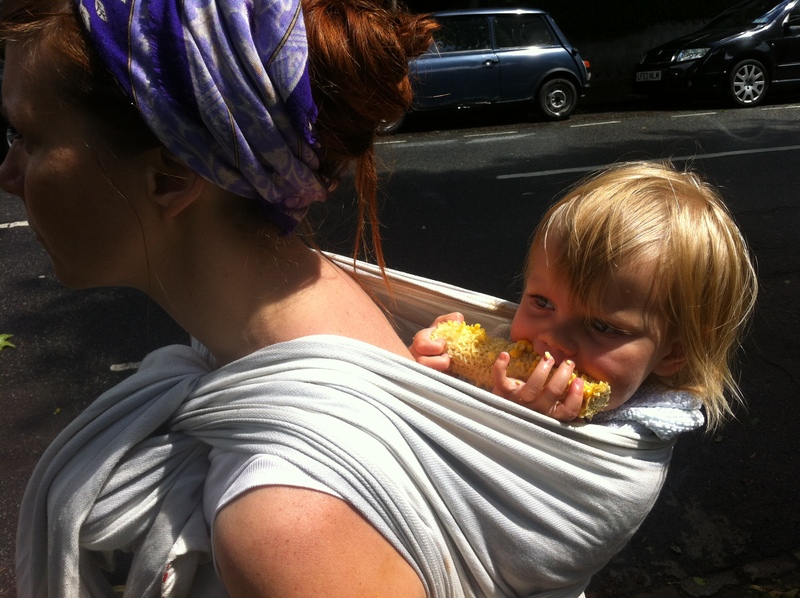 For the first 5 months of Ramona’s life I wore her in a sling every day, for most of the day. I just wanted to keep her close, I felt a small part of me to be missing if I were to let her snooze on the sofa! She would snuggle into me as I cooked and protested and sewed and hiked. 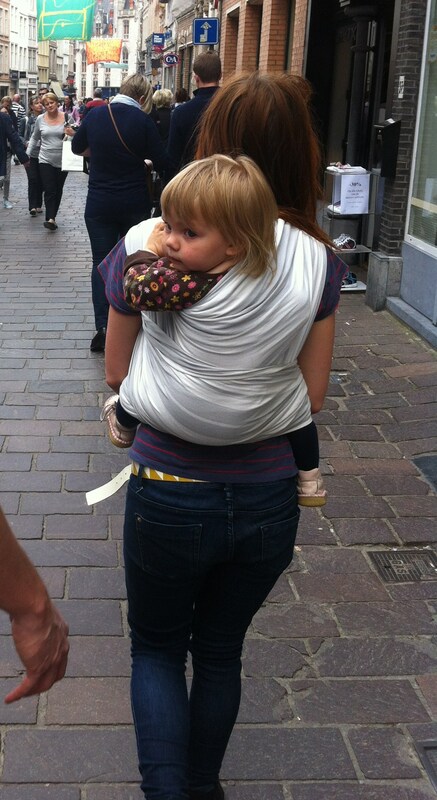 I had a gorgeous ring sling a friend had made, but wanting to be completely hands free I made her a stretchy wrap. By the time she was 5 months old she was a corking 13 kilos and I needed to upgrade to a woven wrap that would made my load a little lighter! 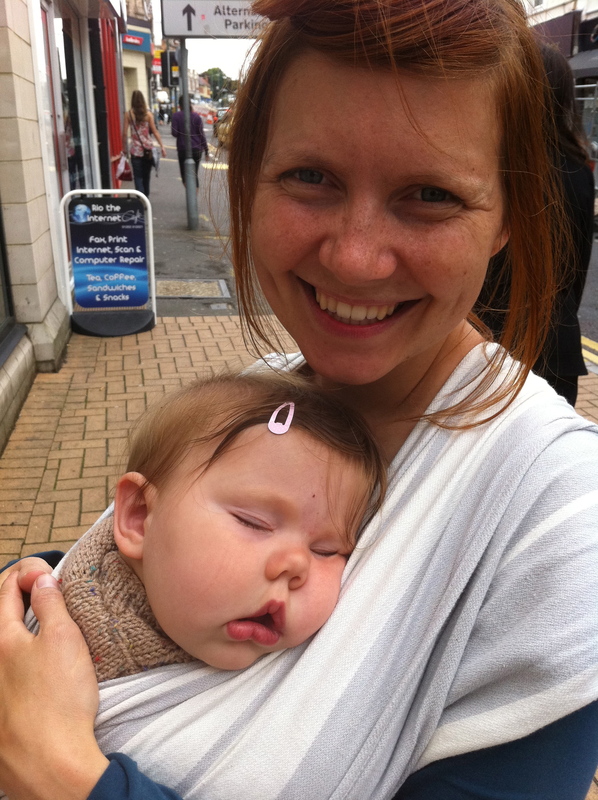 We invested in a Didymos wrap, a second hand one from Ebay, and has been serving us beautifully recently, with our little 21 month old Ramona. Once Ramona got crawling, the cord that tied us began pulling a little bit and it seemed completely natural for her to want to crawl about, away from me and explore the dusty, crevices of our house. I still wore her when we went out and about and for naps and for breastfeeding on the go. When she was 10 months old we found a buggy by a bin, a spectacular huge old Silver Cross and we took it home and took Ramona for the odd spin in that. Ramona enjoyed it- she’d wave at everyone in a very Queen like way, enjoying a wonderfully novel experience, thinking she was the first baby ever to get pushed about on a mini wagon; “Check out my WHEELS!”. It came in pretty handy for loading it up with our big supermarket shop and gradually we got used to using the buggy 75% of the time. Then, a few months ago Ramona gave up the buggy – couldn’t get her in it for love nor money. I buckled her in against her will once and the discombobulation of that haunts me to this day. The wrap is once again making an appearance daily and it feel so right! It saved a buggy strike from becoming an immobilising crisis! Understandably, once your toddler GETS toddling, they don’t fancy being clipped in and pushed about. For Ramona it seems being up high helps her to feel okay with being carted around, she feels involved with her excellent vantage point. I like how unfettered I feel. I walk out the door with my handbag and Ramona on my back and that’s that. Because it is hands free, I can text/ eye up Twitter/ pick my nose whilst walking along, without having to negotiate 4 wheels. (Mind you that could be simply my lack of coordination!) Our buggy used to get layers and layers of stuff packed into it, and bags hanging off all sides. Pushing that around made me feel like that fella off The Road. 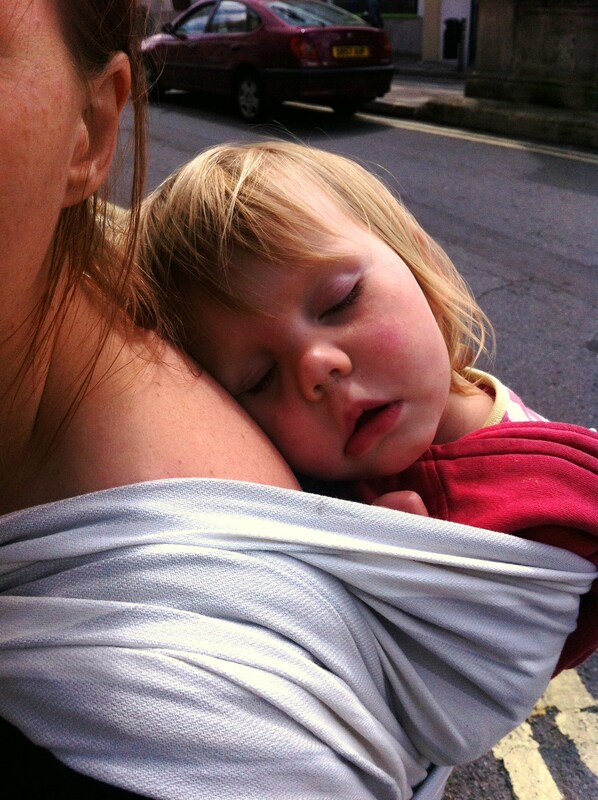 Ramona falls asleep SO easily in a back carry, I love to feel her cheek press into my shoulder as she drops off. If I sense Ramona is a bit excited, or if we have a tribe of souls at our place having fun, bed times can involve much convincing! Sometimes I’ll pre-empt it and will take her for an evening stroll and let her gently off. Transferring her into her bed from a back carry is really simple too – a much lower Wake Up Rate than the buggy to bed transfer! It is especially good for navigating the city crowds and public transport. Going into the centre of the Big Smoke with the buggy used to fill me with dread; having to ask strangers for help up and down the stairs, getting stuck behind a platoon of slow walkers. Now we just whip up and down and right past those meandering snail like tourists and strolling romantics. Do you wear your baby or toddler?